Three US girls, all 14 years old, and one US boy have earned their places in the US Open Junior Championships, which begin Sunday at the Billie Jean King National Tennis Center. The qualifying for juniors is played outside the east gate of the NTC, on practice courts, but there are always plenty of spectators. With the cool and breezy conditions Saturday, Corona Park was full of families enjoying the break from the heat and humidity of previous days, and several wandered by to watch for a game or two. Spectators with more at stake included college coaches, who were getting a second look at Friday's winners as they assessed possible recruits. JJ Wolf drew his share of interest from the top Division I schools, defeating No. 2 seed Yibing Wu of China, 6-4, 6-3. Wolf was serving up 4-1 in the second set, but the 16-year-old from Cincinnati said it wasn't nerves or looking ahead that caused him to lose his serve. "He played a very good game," Wolf said of Wu, ranked 45 in the world. "He's such a solid player, no weaknesses, so if I played a few loose points, he'd be right back in the match, and he did a great job coming back in both sets. I was up 5-1 in the first." Wolf saved break points in his next service game, making a few unforced errors, but ultimately held when Wu made a few in reply. Keeping his concentration and composure appears to come naturally to Wolf, and Wu continued to miss, with Wolf taking the match with a break of serve. 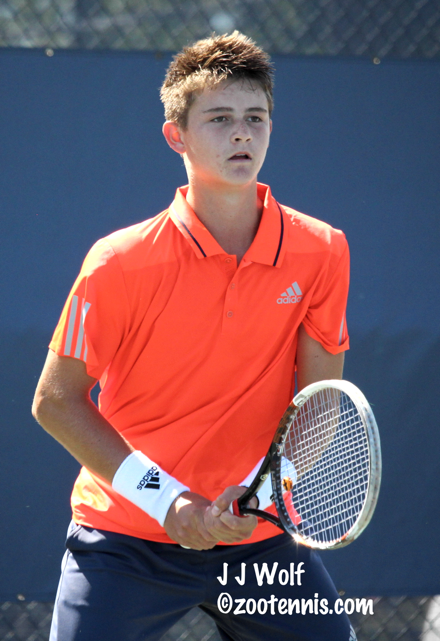 "Before every point, all I say is, do you best," said Wolf, who finished third in Kalamazoo 16s this year as the top seed and was given a qualifying wild card by the USTA. "No expectations coming into this tournament, I'm like 500 ITF, would never have gotten in, so I was just doing what I could with this opportunity. There was no pressure for me; when I was up, it was the same as any other point. A little bit different than Kalamazoo, I didn't do it as well there, but I played some good players there." Wolf had never been to New York before coming to compete in qualifying, and hopes his likely day off on Sunday can include some sightseeing. "I'd never even seen Arthur Ashe Stadium until three days ago," said Wolf, who has attended the Western and Southern Open in Cincinnati. "It blew my mind to see how big this tournament was." 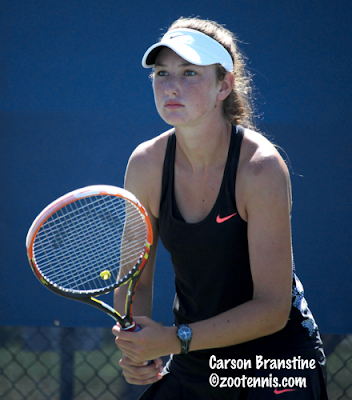 Another newcomer to New York is Carson Branstine, who defeated No. 3 seed Ioana Pietroiu of Romania 6-3, 7-5 to make her first junior slam main draw. "This is the best thing in the whole world," said Branstine, who turns 15 next week. "And this is just the qualifying. I'm so happy for myself that I competed really well. And I'm happy I got a crowd, which is really exciting. It's really cool and I'm really happy to be here." Branstine, who beat No. 10 seed Mayuka Aikawa of Japan in a lengthy three-setter on Friday, is confident heading into the main draw. "I'm ready for anyone," said Branstine, from Orange, California. "I'll take anyone. I'm just glad I'm in the main draw and I think I'm ready to play anyone here." 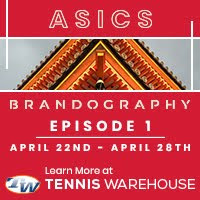 Like Branstine, Amanda Anisimova was given a wild card into qualifying, and she came through against Marie Mateas 6-4, 6-2 in one of the two all-American encounters in the final round of qualifying. Despite the routine-looking score, the match took nearly two hours. "The games were really long and tight, even if it was only 6-4," Anisimova said of the first set. "There were really long points, and I played my best. It was pretty windy, so you had to have more margin on the balls, but overall I think I played pretty well." Anisimova, who turned 14 on Monday, reached the quarterfinals at last week's Grade 1 in College Park, Maryland as a qualifier, and her confidence is high as a result. "I'm very excited," said the Miami-area resident. "It's a great opportunity and I think I can do well. I think I can get pretty far." The final qualifier, who also received entry as a wild card, is Natasha Subhash, who produced what she called "probably the best comeback I've ever made." 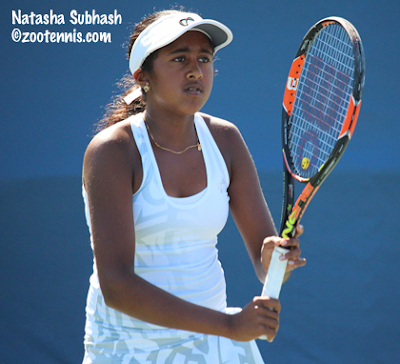 It didn't look promising for Subhash, who wrenched her right knee serving at 2-3 in the first set. A lengthy delay ensued, as Subhash was assessed by the trainer on the court where she fell, and then after walking to her chair, was treated by the trainer and a tournament doctor. Returning to the court with the knee heavily taped, Subhash lost the game and the set, but her movement, a bit tentative at first, returned to normal midway through the second set. Cal recruit Hauger went up 5-2 in the second set, but Subhash got one of the breaks back and held, forcing Hauger to serve it out at 5-4. Hauger had a match point, but didn't convert it, and Subhash held and broke again to force a third set. That too was close, but Subhash continued to tee off, going for winners and frequently making them. She held for 5-4, and Hauger, serving to stay in the match, was broken at love to end it. "Until 5-2, I was thinking about it a lot, but then after that, I just started to focus on playing," said Subhash, who turned 14 on Wednesday. Despite the ice bag attached to her knee, Subhash said she felt "really great." The draws have been posted for the US Open Junior Championships, and they do not include Frances Tiafoe, who decided not to play after accepting a wild card. In addition to the previously announced wild cards, Alexander Rotsaert and Gianni Ross received wild cards at the last minute. I had initially thought Ross would get a special exemption into the main draw as a semifinalist in Repentigny, but because he was not in qualifying on his ITF ranking, he was not eligible for an SE. With qualifiers and wild cards, the US has 19 girls and 15 boys competing. Five of the top nine seeds in the boys draw are American, including No. 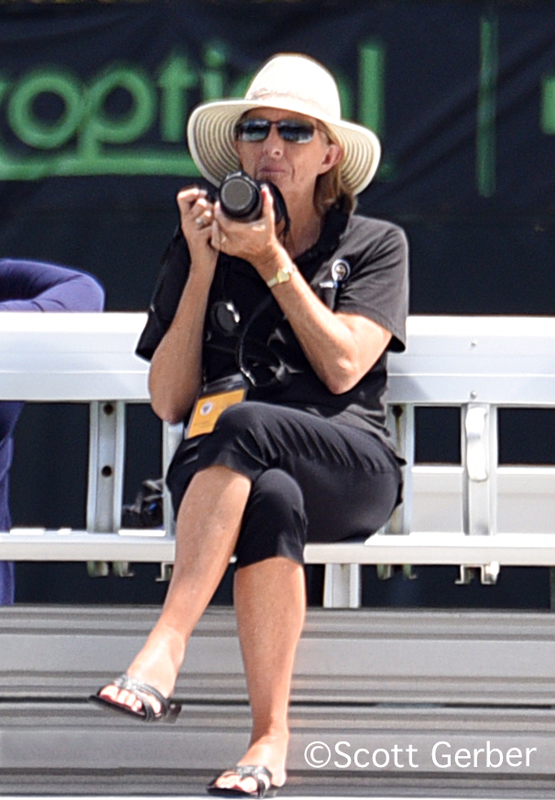 1 Taylor Fritz and No. 2 Michael Mmoh. At the Grade 1 in Repentigny, Canada, No. 5 seed Mate Valkusz of Hungary defeated unseeded Felix Auger Aliassime of Canada 6-2, 4-6, 6-4 to take the boys title. No. 11 seed Bianca Andreescu avenged an earlier Grade 1 final loss to fellow Canadian Charlotte Robillard-Millette, taking the girls title with a 6-1, 6-2 decision over the No. 2 seed. Get Up DY!!..... Or from Lil Mo Days....Donald:). Good luck next Round! !